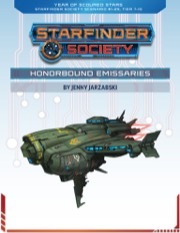 A Starfinder Society Scenario designed for levels 7-10. There is so much going on in this scenario! The encounters were a lot of fun and we nearly got all killed (nearly dying is fun!). I just felt there were so many things, I probably missed some plot points here and there. I think this scenario will benefit from being run in a longer timeslot in a quiet enviroment, so that its easier to understand all the things going on. The opening premise for this mission is… convoluted. Captain Yuluzak, who runs a salvager, discovered a starship wreck, took what was valuable and returned to Absalom Station. Some objects he kept, and others he sold to a pawnbroker named Julzakama. Juzakama recognized one of the objects as an important piece of art and contacted some people he thought would buy it. One of those people, Iteration-177, recognized the object as belonging to a culture that was once a part of the Scoured Stars Trinary System, so he contacted Luwazi Elsebo. Luwazi had the object brought to her, along with a team of Starfinders, Iteration-177, and Captain Yuluzak himself. Luwazi tasks the PCs with travelling aboard Captain Yuluzak’s ship to investigate the original wreck. There they’ll determine the ship’s origins, and travel there to investigate and (hopefully) make some new allies. This scenario was big with a capital ‘B.’ It involves the Scoured Stars storyline, the jinsul, a new solar system full of inhabited planets, three new races, people to save, important decisions to make, a massive starship battle, and combat on… well we’ll leave that part secret for now. Haha. To say this scenario is bold is an understatement! The entire hospital section of this scenario was particularly well handled, (although the building layout was strange to say the least) as were the NPC interactions found throughout. And the setting for the final battle? Epic! Your PCs are sure to come away from that fight feeling like badass action heroes. It’s going to be a ton of fun to play. ...but in Honorbound Emissaries you always arrive in the exact right place at the exact right time in order to avoid something troublesome. Heck, you even travel through a massive space battle and don’t get attacked by either side. At all! In fact, you even manage to approach the planet and land without a single threat or altercation. It’s like you’re invisible. Which brings me to the second down-side: starship combat. This scenario should have had one. Getting to witness an epic starship war and not engage in it at all is kind of a let down. And how fun would it have been to help out the crew of the Honorbound? Now, I get why it’s not in here. This scenario has more than enough encounters to engage in, and they’re all cool. But, it would have been nice to at least see the ship you’re on come under attack. Or mention the bumpy ride as the pilot has to take evasive maneuvers. Something. …But that final battle! Wow! Haha. Truly the highlight of the scenario. Overall I liked it. I had typed out a whole review of this, but the site ate it and I am not overly motivated to rewrite it. I will restate a few points. Great progression and story. Great force of party splitting (other will not like it but they take the game too seriously). This was a good opportunity to have a "defend this spot for x time" event, but it did not. It would be nice to see those occasionally. I ran this scenario for a table of six players at the 7-8 subtier. 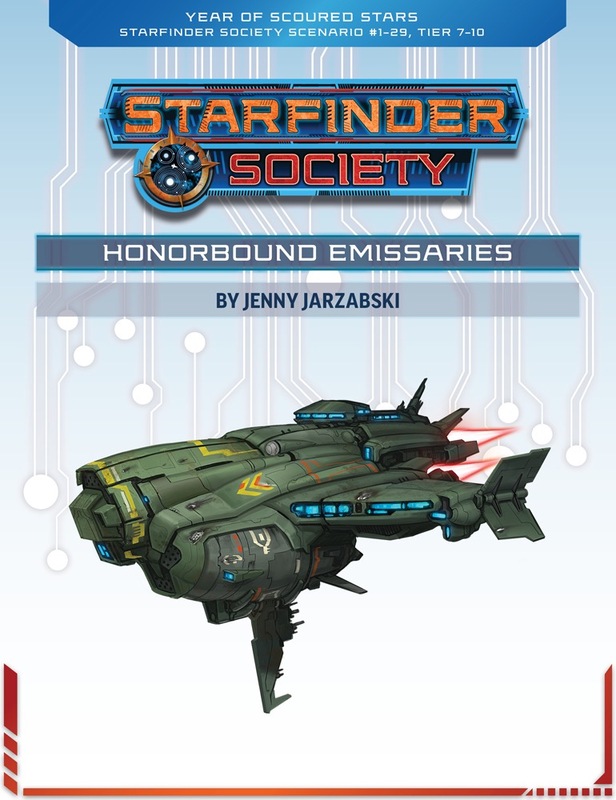 Honorbound Emissaries is Starfinder Society's first foray into the 7-10 tier, and offers the veteran crew an opportunity to reunite with old friends as they pursue peaceful contact with a potential ally in the Vast, and battle against familiar foes with new tricks. While the scenario is certainly entertaining, it possesses a number of flaws that prevent it from being a noteworthy first mission at tier 7-10, beyond simply being the first mission at tier 7-10. The first of these flaws is its cast of NPCs. The mission reintroduces the players to an old friend and an old favorite, and the majority of my table became very excited when they heard the character's description. He exudes personality, but that personality is mostly constrained to someone yelling at you over the comms like the disembodied voice of some plot-exposition character in a video game. The starship crew the PCs befriend is equally colorful, although that color is constrained to a sentence or two personality and meaningful (or perhaps I should say "gainful") interactions are locked behind particularly narrow interpretations of how those personalities might manifest. There is too little room for the cast to fully express themselves to the PCs and become truly memorable, beyond the eccentric captain who is already known because of his prior escapades. The next issue follows from the cast. When I said "gainful" interaction, I meant exactly that. The PCs must interact with these NPCs in order to gain story-specific, and rather arbitrary, rewards. Failure to interact with the crew within the narrow context set by the scenario means the PCs actually lose out on end-of-scenario rewards. This is not the only time the scenario encounters issues with its reward system, however. In another scene, the PCs are given the choice of retrieving an object or performing a more humanitarian task. If they choose to act in a humanistic manner, they actually lose a monetary reward, but gain nothing for it--no boons, no benefits when it comes to interacting with other NPCs--nothing. It seems strange to me to punish players for valuing lives over profit, but that is exactly what happens. The final issue is with the narrative itself. The entire plot of the mission is kicked off by the discovery of alien art that prompts the Society to investigate further. However, the scenario has no information about the art or its significance to the alien culture that produced it, even in the event the PCs ask about it directly, as my table did. I found it frustrating, since it seemed like a thoughtful line of questioning that I couldn't reward appropriately. This is not to say the scenario is entirely bad, however. Although I found part one to be rather tepid, part two picks up significantly, and culminates in a fantastic set-piece that is definitely the highlight of the adventure. If I have one thing to say, it is that, perhaps, it ended too early because the players were too good at being action heroes. In summary: Honorbound Emissaries brings back a familiar and popular character, and attempts to generate an expanded cast of colorful characters with mixed effect. Its questionable reward scheme and constrained narrative make for a frustrating time, but one that is easily forgotten in the excitement of the final act. It is a passable first attempt at a tier 7-10 adventure, but I should like to see tighter, more thoughtful storytelling as the heroes advance toward unmasking the truth about the Scoured Stars and its inhabitants. As a medical professional, I found the depiction of the "hospital" in this scenario particularly egregious. The building is, to start, too small to be a hospital. It is a clinic, at best, and one with a strange set-up that defies medical expertise. It has 22 beds but 5 toilets, and there are no toilets directly accessible from the ward. Furthermore, the ward can only be accessed through a greenhouse filled with psychic fungi that can cause dangerous delirium in the unprotected. To call this a serious workplace safety issue would be an understatement. Woot! I can play again! Oh man: "...ended up in the claws of an Absalom Station pawnbroker." Will Yuluzak return? I look forward to more interaction with the crew of the Honorbound, this mission looks exciting. Sooo stoked to play my level 10 character! Thanks ahead of time for the opportunity!